_ _I think most adolescents have the shared experience of stealing their parents’ magazines; hiding them under their bed or between the mattresses; reading them by flashlight under the covers; praying they won’t get caught. Except the magazines that I found myself taking were especially depraved… They came from the twisted mind of a one Martha Stewart. Seriously sick stuff. I can only blame her for my unceasing need for meticulous perfection. As my friend Sam once told me, “You have an amazing attention span for the most ridiculous things.” And I’m proud of it, baby. _ _So what if my sister came home, saw these masterpieces and called me a psycho; so what if my boyfriend’s family didn’t believe I had made them myself; so what? They were delicious, beautiful, and they were devoured. Thanks Martha, ya deviant. 1. Sift together the flour, baking soda, and baking powder into a large bowl. Set aside. 2. Cream together the butter and brown sugar until fluffy. Add the spices and salt, and then eggs and the molasses. Reduce the mixer speed and slowly add in the flour until just combined. Note: At this point my dough was still too dry so I added a tablespoon of water at a time until I got the right consistency. 3. Divide the dough into halves and wrap them in plastic-wrap, patting into disks. Refrigerate until chilled (about half an hour). 4. Preheat oven to 350°F. Roll out dough on a floured surface to about 1/4-inch thick. 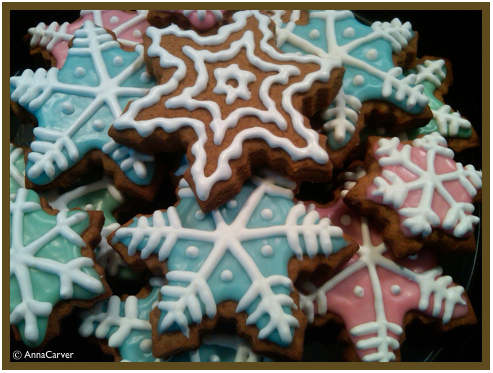 Cut into various shapes (I used all snowflakes) and place on a parchment paper-lined baking sheet. 5. Bake until the cookies begin to get crispy, but not dark; about 12 minutes. Allow cookies to cool on a baking rack. I iced my cookies with a powdered sugar and half-and-half mixture and various food colorings. There was no measuring to make this icing, I just added the half-and-half to bowls of sugar until it was the consistency that I wanted. After that layer dried I decorated them with royal icing that I piped out of a sandwich bag with the tip cut off. *see comment for “Royal Icing” Valentine’s Day cookies. Same applies here.